Doomsday for the roosters finally arrived. They had a good life while it lasted. Food and fresh water and shelter around the clock. 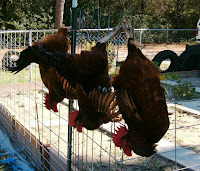 Hoppy even got to bunk with the three hens so he had an extra good life ...hens with benefits! But all good things must eventually come to an end. The chicken coop was here when we moved in but it was in pretty sad shape. Yeoldfurt put a lot of hours into refurbishing it and we bought the chicks to begin with so we could have fresh eggs. 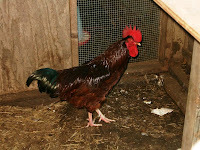 Since roosters don't lay eggs, they were freezer-bound from day one. 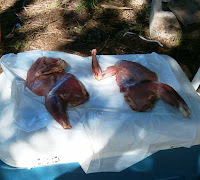 I've butchered chickens the old-fashioned way many a time and the only part I really dislike is the de-feathering. It's messy and tedious and you end up with wet feathers everywhere. So a few weeks ago, I did some research online and found a site that described a method of skinning the chicken. I never thought of that! It promised to be a much faster process and since the skin is where most of the fat is on a chicken, this method would produce a much healthier end product. So I printed it out and that's the method we used. 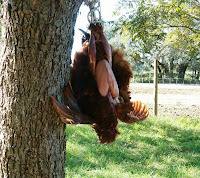 Initially, you tied the birds' legs together and hang them upside down so they eventually pass out. Here are three of the boys, waiting for their turn. Even with the little pea-sized brain that chickens have, you have to wonder what they must have been thinking. I warn you that the next two pictures might be too graphic for some. This is about butchering chickens. Any meat goes through some pretty gruesome stages before it's fit for the freezer. So scroll down at your own discretion. After the birds have hung for a few minutes, Yeoldfurt used an axe to cut their heads off and then hung the carcass on a tree hook we have to let them bleed out a little. There is surprisingly little blood in a chicken, but there's enough to get you messy if you're not careful. We found out the hard way. With the bird hanging from the tree hook, Yeoldfurt used his little pocket knife to trim the hide starting at the legs and working down. The hardest part proved to be the wings because they are relatively fragile limbs on a bird and, even with using the knife, you have to pull pretty hard on the skin to separate it from the bird. When the skin was completely removed and the bird was gutted, Yeoldfurt took a short break and let me take over. I rinsed them off good with the hose and put them in plastic bags in the ice chest. Icing them down right away hopefully kept them from drying out too much. When all the birds were done and the tools were all cleaned and put up, Yeoldfurt took a well deserved break and I took the cooler up to the house to clean the birds a second time and vacuum seal them for the freezer. (Thank you SanJac and MrsSanJac for our FoodSaver...what a nifty contraption!) The split halves fit very nicely in the vacuum seal bags I had made up. Since these birds are skinless they will have to be cooked in such a way that they don't dry up like shoe leather. But I've already thought of a few ways to accomplish that. There will be times when I do want a bird with the skin on, like for roasting with stuffing. But on those occasions, I will splurge on store-bought and let someone else deal with wet feathers! The article said it would take about 20 minutes to do one bird but we found that it took about twice that long. Maybe the author of the article was exaggerating his own prowess at the process or maybe we were just slow because we had never done it this way. It took us about five hours, start to finish, but that included about 30 minutes to get set up and another hour to clean up and package the birds for the freezer. If we had been doing it the old fashioned way and de-feathering them, it would have taken even longer, I'm sure. I told Yeoldfurt after the third bird, "Now I know why our great grandparents only did one chicken at a time!" Reading my friend SciFiChick's post about the frustrations of being surrounded by scoffers and sheeple got me to thinking. I was one of the sheeple not too long ago. I am a bit of a Pollyanna sometimes, always wanting to see things in a positive way. But I'm a realist too and I can see that 'the change' that was promised is not the 'the change' we are getting. I still believe in this nation and the vast network of preppers I'm seeing gives me hope that we will survive whatever the future holds. But surviving does not mean things will ever go back to what they were. I will continue to talk to other preppers, to glean information and to share what I might have to offer with like-minded individuals. And I will continue to urge family and friends that I care about to see what's happening and start prepping for themselves. But I think it might be time for us to become a bit quieter when we're amongst people we don't know. What was that several months ago about this administration setting up an email address for people to send in the names of people they thought were not 'with the program' so to speak? I don't remember the details. Yeoldfurt is the expert on this stuff. I do remember that the some spokesperson later said that the whole thing was a misunderstanding and they took canceled the email address. I don't think it was a misunderstanding at all and it sure got my hackles up. I think we need to stay close to those we are close to, choose new friendships and associations wisely, and just keep doing what we're doing for ourselves. Like the cats in this picture. Cuddle up with those we know we can trust but keep a watchful eye. The weather is cooling off and the landscape is changing as the trees begin to blush with fall colors and drop their leaves. It's time to start thinking of holiday recipes. I found this one online at http://www.eggnogrecipe.net/chocolate-eggnog-recipe.html. I tweaked it just a little for our taste ...you know I've got to tweak! Sounds good though, doesn't it? In a large saucepan over a medium heat, pour the milk and chocolate milk. Heat the milks, but DO NOT BOIL. In a large bowl, beat the eggs and brown sugar until they are well combined and of a reasonably thick consistency. When the milk mixture is hot (but not boiling! ), add approximately half of it to the bowl containing the beaten eggs and brown sugar. Whisk well. Pour all of the egg, sugar & milk mixture back into the large saucepan. Reduce heat to low. Slowly and gently, add in the cream. Stir continuously until the mixture has thickened enough to be able to coat the back of a spoon. Remember not to ever allow the mixture to boil. Remove the eggnog from the low heat. Stir in the ground cinnamon and ground nutmeg. Cover with plastic wrap and refrigerate until chilled (at least 3 hours). To serve, ladle the eggnog into individual glasses, and garnish with a little grated chocolate or ground cinnamon. Grate bakers chocolate on top as a garnish. And now, for those who want a little more from their eggnog, I have included the original recipe below. Pour all of the egg, sugar & milk mixture back into the large saucepan. Reduce heat to low. Slowly and gently, add in the Kahlua liqueur/ coffee, and then the cream. Stir continuously until the mixture has thickened enough to be able to coat the back of a spoon. Remember not to ever allow the mixture to boil. ps I don't know what's up with the spacing inconsistencies with this post, but I'm in too good of a mood thinking about chocolate eggnog to let it bug me! I've been thinking a lot about this subject lately. Recycling has been in vogue for at least a couple of decades now. It was popularized in the 70's by the environmentalists and ecologists to slow the volume of waste going into our landfills. But then a few entrepreneurial minded folks recognized our society's throw-away mentality as the next big business opportunity and recycling evolved into a huge industry in its own right. Most of us prefer to buy our favorite consumables in convenience sizes which ultimately means more packaging for the same volume. The recyclers love that about us. As preppers, we strive to store food and necessary supplies so we will be able to take care of ourselves and our families in a crisis situation. Whether the crisis is short-term or long-term, a natural disaster or manmade doesn't really matter. When you're in a crisis, your resources and viable solutions are far more important than the cause of the crisis. If you've been storing food for any length of time, you're bound to have had some issues with space and packaging. We are fortunate to have a large indoor pantry and lots of extra closet space in the house. We also have an air conditioned storage barn on site that has made an ideal storage area for food stuffs and supplies. Packaging has been our big challenge. Once you start storing food stuffs outside, you have to be ever vigilant about rodents and bugs. We use several layers of packaging to protect the food items as much as possible. Most everything is kept in its original packaging but then re-boxed in plastic tubs with tight-fitting lids. If you have cats and buy a lot of cat litter, the big squarish buckets of litter have hinged half lids that snap down fairly tight. We've saved those cat litter buckets for years and used them to carry gear or food stuffs when we went camping. But they've worked out great for the food stores now as well. Yeoldfurt has been working on a written inventory of our stores and that got us both to thinking how we are storing things and how many items we have 're-purposed' to suit our new prepper lifestyle. The cat litter buckets are just one example, but there are so many others now. I posted a few months ago about filling clean two-liter soda bottles with dry goods like flour, sugar and salt. Before realizing how useful the two-liter bottles were for storage, I had been in the habit of buying soda in 12 packs of 12-oz cans. Those cans are of no use to me after they're empty, but the two-liter bottles had repurpose value. So now I buy two two-liter bottles instead of my one 12 pack of cans. Liquid Laundry Soap in 174 oz Jugs I love liquid laundry soap because it's easier to measure, and it disperses more readily in the washing process so it never cakes or leaves residue on your clothes. If you buy it in the big 174 oz jugs with both a screw lid and push-button spigot on one end, save those empty jugs. It's nearly impossible to drain them completely of the soap product. So when I've used them up, I fill them with water and label them 'Wash Water.' There will be enough residual soap in there to make sudsy water for washing anything from hands to silverware and dishes. No, it won't be hot water and, yes, it's laundry soap not dish soap ...but it's soap. In a SHTF situation, it may be the best thing you've got. Wide-mouth Glass or Plastic Jars The 48-oz wide-mouth Miracle Whip or Mayonnaise jars are one of my favorites. The wide mouth makes them easy to fill and easy to access. I like to store spaghetti or angel hair pasta in them. I wash the jar and lid, removing the label and the cardboard 'gasket' under the lid. Make sure the jar is very dry, then break the pasta strands in half and put them in the jar. I realize 'breaking pasta' is a no-no in some circles, but I need to cook so little at a time for just Yeoldfurt and me that I usually only boil water in a 2 quart sauce pan. I end up having to break the pasta to fit it into the pan anyway, so I might as well store it that way. But I like these jars because they are made of thick food-grade plastic with good memory (holds its shape), and they are flat on the sides so they can be stored upright or laid flat. Plastic Gallon Milk Jugs with Screw Tops Most people buy milk in plastic jugs these days. Whether you buy quart or gallon jugs, try to buy only jugs that have screw, not snap on, lids. It only takes a little pressure to pop the top on a snap on lid and there's nothing worse than having something you went to all the trouble to store get wasted because a lid pops off. Even if you just store water in the jug, in a SHTF situation, water will be as precious as anything else you've stored. If you have two jugs, one with a screw top and one with a snap on lid, and you just tip them both over ...the one with the snap on lid will usually come open. If you laid it very carefully on it's side, it might hold for a little while, but eventually it will leak from the sheer water pressure against it. The screw lid will hold as long as the jug itself holds. They're the same price, so buy the one with the screw top because that suits your repurpose need better. Industrial Buckets for Food Items A lot of the supplements we buy for the horses come in 10 or 20 or 30 pound pails. These buckets are heavy food-grade plastic with bales strong enough to support the weight of product in the bucket and lids that usually have real gaskets in them. We've used them for years to tote supplies or food that did not require ice when we were camping. The empty buckets are a good size for a stool when you're out camping too. Now that we're prepping, they make great 'outer wrap' for food items we want to store long term. The key to using them for storage is good labeling. I like a label on the side AND on the lid. If we store several things in one bucket, Yeoldfurt lists them on the labels. Then if we use an item out of the bucket, he crosses it off. Industrial Buckets for Non-Food Items All of the home improvement stores and most of the department store that have a paint section sell empty paint buckets with gasketed lids. These buckets are not necessarily food-grade plastic but they are extremely sturdy, are rodent and bug-proof and have an air-tight seals. So they would be good for storing nonfood items such as medical or cleaning supplies. They also make great pots for planting tuber type vegetables such as onions, carrots, potatoes. If you use them to grow food, you will need to create drainage. So punch three drain holes in side walls, as close to the bottom as you can get. Then line the bottom with two or three inches of rock or gravel before filling with dirt. Plastic Grocery Sacks A dear friend of mine taught me how useful these little freebies are. I went to see her one day and she was sitting at her table folding them up into little triangles. Remember the little paper 'footballs' we used to make when we were in school? Fold a sheet of paper the long way twice so that it is only a little over 2 inches wide. Then start at one end folding the corner diagonally to make a triangle and again and again ...like you are folding up a flag. When you get to the end, you tuck the residual into the seam of the previous fold and you end up with a neat little triangle. She was doing this with her plastic grocery sacks. I was curious and asked her why. She said that eventually she expected them to stop giving the bags away at the grocery stores and she wants to be prepared for that eventuality. She said she carries two or three in her purse all the time saying, "you never know when you might end up with a little more than you can carry in two hands." Then she laughed and said they work in a pinch for a rain rat too. She's definitely right that they will probably not always be free. And they are useful for a lot of things so good for her for stocking up. This is a short list of examples. But I am trying to retrain myself to consider whether there is repurpose value when I am deciding which items to buy and also to consider whether there is a repurpose value again before I discard things. Like prepping, it's a mindset, and I think it will pay dividends in the long run. Have You Ever Wondered Why ....? The English language is very inconsistent. There are rules embedded within other rules, and then there are the inevitable exceptions to the rules. Remember the old 'i' before 'e' except after 'c' or when sounded as 'a' as in neighbor or weigh? Remember that one? And I swear people make up words. Smart people. And they do it just to mess with our heads. In this computer age, we all are familiar with the terms 'bit' and 'byte' as they relate to computers. (Okay, most of us know...) The term 'bit' originated from binary digit and described what was at the time the smallest measure of information on a machine ...only able to hold one value, either a 0 or a 1. Do you know what you call 8 bits in a row? A byte ...pronounced 'bite' ...now tell me someone did not have their tongue firmly lodged in their cheek when they decided on that nomenclature! Okay, so a byte represents 8 consecutive bits ...but it gets worse, folks. What if you don't feel like a whole 'byte' today? You can settle for just half of a byte which is appropriately named a nibble! See 'tongue in cheek' reference above. And some people say the nerdy scientific types have no sense of humor! But even the non-science related aspects of the language can be confusing. Ever get tangled up trying to figure out if you want to ensure or insure something? How about affect or effect something? How about this one ...if 'notoriety' is such a good thing, why is being notorious such a bad thing? And this one ...if labeling someone inept at something means they are really a screw up at that particular thing, why then aren't people referred to as ept if they are really GOOD at something? Then there's the whole 'hot water heater' thing. Ask a dozen people what they think the problem might be if your shower won't draw hot water and at least 10 of them will tell you the hot water heater is out. Well, folks, it's a water heater not a hot water heater. If the water was already hot, why in the world would you need to heat it? These are just random thoughts the likes of which rattle through my head on a daily basis. Yes, it is scary to be me sometimes! One of the big items on my agenda for this weekend was to cook and pressure can seven quarts of chili. The pressure canner I bought has a maximum capacity of seven quarts. I have only used once before today and only canned four quarts that time. I'm always looking for ways to conserve energy and am interested in knowing how well the pressure canner will process at full capacity. But unfortunately, I've discovered that although my pressure canner can hold seven quarts, my crockpot can apparently only hold four or five quarts. Since I'm only canning soups and stews for now, everything gets cooked in the crockpot, then transferred immediately to the hot quart jars for processing. So the number of quarts I process at one time is, for the moment, limited to the amount I can cook up in the crockpot at one time. So I will have to postpone my seven quart canning experiments until I process some fresh fruit or vegetables and can make sure I have enough on hand to do seven quarts at one time. Today's efforts were not wasted though. In another forty minutes, the processing time will be finished and the cooling process will begin. By this evening, I'll be able to set my four quarts of homemade chili next to the four quarts of Spring Skillet Stew I processed last week. A full cupboard is a beautiful thing! When Yeoldfurt first suggested putting in a vegetable garden earlier this year, my initial reaction was to point out how much work would be involved ...not just in building the raised bed or hauling the dirt to fill it or planting the first seeds, but also in tending the plants, harvesting the produce and preserving the bounty. I had a good-sized vegetable garden back in the early 90's when I was living in Grand Junction, Colorado. That part of Colorado is high enough in elevation to have plenty of snow and frost in the winter, but close enough to the Utah desert to have some pretty sweltering summers. If you don't water, nothing grows. That garden was roughly 20x25 and was not raised bed, so it was a constant battle to keep the lawn and weeds from trying to encroach on the moist loosened soil of the garden. But my life rhythm and circumstances were much different then. I lived in the city and worked just five miles from home. I also worked an early shift and was home by 2:15 in the afternoons, which left me with lots of daylight time to work a garden. When we moved from Grand Junction to San Antonio a few years later, I had a similar sized raised bed garden built in the backyard there too. I did a raised bed in San Antonio because the topsoil two or three inches deep at most. Then you hit caliche which is as hard as a rock when it's dry and the consistency of nearly set concrete when it's wet ...not a good growing medium for vegetables. The raised bed garden with 8 inches of good topsoil in it did well and I was pleased to discover it was much easier to maintain. I had the same advantages in San Antonio of a job very close to home and an early shift to accommodate afternoons of outside chores. I was also feeding a family of six in those days, so nothing went to waste. These days though, it's just Yeoldfurt and me unless we have visitors. My day job is over forty miles from home, so almost two hours of my day is spent commuting. That leaves me with very little time and even less energy by the time I get home on the weekdays. We also have livestock now that I didn't have when I was gardening in Grand Junction and San Antonio. Don't get me wrong, I love everything about where we live now and our country lifestyle. The only thing I would change if I could is my long commute. But because of our current lifestyle and circumstances, the first thing that popped into my head when Yeoldfurt suggested we put in a big vegetable garden was ...ugh ...more work! We had several long discussions before we decided anything and the only caveat I ended up putting on the project was that we eat what we plant. Bartering at the local farmer's market was another discussion we had been having but I was (and still am) of the opinion that you can't count on someone else wanting what you've got or on them having something you want to trade for. Waste is one thing I have a hard time with, so I wanted to make sure the garden's primary function was our own subsistence. Yeoldfurt agreed so we started building the garden with every intention of sowing seed by early April. We didn't have a crystal ball though and due to some unforeseen and extremely unhappy circumstances, we didn't finally sow any seeds in the garden until the first week in June. It was a late start during a period of record high temperatures and an extended drought ... and all those things had an adverse affect on our first crop. But taking all those things into account, I'm grateful we had a harvest all. We ended up with four very sweet, very juicy cantaloupes, about a dozen 'meals' of Swiss chard (fresh picked for each meal), and six ears of corn. Hardly a bounty worth boasting about, but there's always next time. One of the best things about living in Texas is the long growing season ...practically year 'round. I spent about an hour in the garden this morning. We still have five bell pepper plants that are producing. Yeoldfurt loves stuffed peppers. There are two are three out there now that should be ready to pluck in a week or so, and eight or nine others coming along behind and still flowers on the plants. So bell peppers may end up being our bumper crop for the spring this year. The Swiss chard would have been still going strong too, but some kind of little worm had gotten to it. I left the pepper plants alone but cleaned out all the other sections. So I pulled it all up and will start over with seed. I pulled whatever weeds and little grasses were sprouting, turned over the dirt and worked in some compost in all the open sections. Tomorrow, hopefully, I will plant some carrots and Swiss chard. Our raised bed is divided into eight sections which are approximately 3-1/2 feet x 7-1/12 feet with 1x12 boards laid between them as walkways. The pepper plants occupy about half of one of the sections and six buckets. We have six large buckets we'll be using to plant carrots in, but those will be up by the porch and not in the garden. For the winter, I want to plant three sections of Swiss chard (so I'll have enough at one time to can several batches), two sections of white potatoes, one section of sweet potatoes, one section of cabbage. The unoccupied portion of the section where the pepper plants are now will be for onions and garlic. Onions on prolific and a great source of iron. They are very versatile as well. They can be dehydrated or chopped fresh to use in cooking, steamed with butter and salt and pepper to eat by themselves, or vacuum sealed and frozen fresh. Potatoes are also a prolific crop and an excellent food source. Sweet potatoes can be prepared any way you would prepare white potatoes, but also are a cheap substitute for pumpkin in pies and sweet breads. Yeoldfurt is not much on coleslaw, so I will probably can most of the cabbage ...either by itself or in soups or with meat like corned beef. I want to experiment with vacuum sealing and freezing fresh cabbage leaves (blanched first) to use later for cabbage rolls. I'll let you know how that turns out. The work in the garden this morning involved a lot of bending and stooping and stretching and lifting which, by most people's way of thinking, would have constituted a lot of work. By my way of thinking earlier this year, it would have sounded like a lot of work. It was labor and it did require effort and energy and perseverance to get the job done. But it was not really work, it was a joy. The only thing on my mind while I was turning over the soil and raking through the beds this morning was what I was going to plant where and how I was going to preserve what we harvested in a few months. Now all that's left to do is plant and look forward to the harvest. What a great way to have spent my morning. We've been slowly but surely building up our stockpile of food and necessities for about six months and you would think we would have had it all figured out by now. But I had an epiphany last weekend when I opened a new bottle of ketchup. It was one of those big 64 oz bottles. It had lived on the shelf in the cupboard for several weeks since I bought it. But now that it was opened, it would need to be refrigerated. Then it hit me ...what would we do if we were actually living out of our stores in the worst of scenarios ...no power for weeks or months or even longer? Anything that we opened and didn't consume completely in one sitting would go to waste. What a tragedy that would be. I had already decided to process food in one-meal quantities (canning quart jars of stews and soups) with the idea that in a real crisis where lack of power might go on for longer than a few days or weeks, we would not have a way to refrigerate and store leftovers. It would also help us ration our stores to be able to look at the shelves and count jars to know how many meals we still had ahead of us. I thought I was being smart to process foods in quantities that we could consume in one meal, and I still thinks it's a good idea. But I had not carried the thought through far enough to consider things like condiments. How many condiments do we all commonly use these days that are shelf worthy only until you open then ...they all say 'refrigerate after opening' right there on the label. Waste is never a good thing, but in a crisis situation, it's downright sinful. There's nothing I can do about the stores I already have set back. But from this point forward. any condiments like mustard, ketchup, mayonnaise or pickle relish that I want to stockplle, I will buy boxes of them in the little single squeeze packets at Sam's. Any time we go to a burger joint or drive through and they offer such condiments, I will smile and say, "Yes, please" and take as many as they are willing to give me. Chicken places often have little packets of honey and even butter, free for the asking too. Use the large quantity items you already have stockpiled now that will require refrigeration after you open them. In the meantime, never turn down a free condiment, people. You never know when that might be the best thing you tasted in ages!